I don't have a stupid question at the moment, entirely because a couple of my stupid questions are posited in much smarter ways and answered above. So I'll just add: great thread for all of us with a lot of catching up to do, and many thanks to those more knowledgeable posters skimming and answering as they can. Newbie here. Been watching the arctic for a few years, lurking here some weeks, and a weather junkie on many fronts. I am a geneticist, not a meteorologist or physicist, so I am pretty ignorant currently. My stupid questions: 1. Where are people finding close to real-time satellite images as opposed to the once a day updates to build those cool composite maps, without the big swaths of cloud cover hiding stuff, and 2. Is there any previous record of the massive amount of random ice rubble that we are currently seeing in the arctic basin? If not, why isn't it all over the place in general news? Welcome, helorime, and very good stupid questions. 1) Have you checked out the Arctic Sea Ice Graphs page? Where did you see someone post such an image? You can fiddle with images from IJIS or the 3-6-7 Bands on the Terra satellite. Other than that, there are folks here - like Wipneus - who retrieve microwave data themselves and build their own sea ice concentration maps. 2) The random ice rubble is to my knowledge unprecedented in this phase of the melting season. 2010 was similar, but only at the end of the melting season. It isn't in the general news because it's not enough as of yet (and the mainstream media is what it is). It has to be worse, preferably combined with low extent/area numbers. Give it time. Thank you I knew about the graphs page but not the satellite sites. Interesting color coding. About the rubble, I guess if there is no precedent it is impossible to predict the effects it will have. It seemed to me from the first time I spotted it that there would be catastrophic melting, but that has not happened (yet). , there are folks here - like Wipneus - who retrieve microwave data themselves and build their own sea ice concentration maps. Certainly not microwave data. The data from uni hamburg is already gridded concentration data, from which I build maps, calculate SIA, SIE and what else is interesting. I apologize for ascribing super powers to you. It seemed to me from the first time I spotted it that there would be catastrophic melting, but that has not happened (yet). This is often the interesting thing about the melting season - which is also why this melting season reminds me so much of 2010 - in that there's always a lot of melting potential, but at the same time the end of the melting season approaches which could cut that potential short. In this case the end of the melting season is still quite some time into the future, and so the unprecedentedness will become more visible/obvious, but at the same time the ice pack could become so dispersed that the end of the melting season can cut all of that potential short. Right now I feel anything is possible, even a new record. I think I found it yesterday hiding in the "Terra/MODIS Corrected Reflectance (3-6-7)" layer on NASA Worldview. So, my stupid question is: Have I actually found the famous "Goat's Head", or is this just a coincidentally similar shape in the same general area where the real Goat's Head was last spotted? Interestingly, the shape is only visible--at least to my untrained eye--with the Terra MODIS 3-6-7 Corrected Reflectance layer. I asked the question on Neven's blog, but I think this is probably the most appropriate place. Update: Ah, I just saw when I posted, the attachements did indeed show-up in the post (even though they didn't show-up in the preview). I can't make out that shape at all without your cropping. It's also 90 degrees rotated from the last time the goat's head was visible on Ascat (first few days of June), and less than a third of the size. I think the goats head bought the farm during PAC 2013. The "goat's head" May 28. Buoy drift maps show insufficient movement for the goats head to have moved that far. So the answer is; "no, that is not the goat's head." Now that I see the proper scale, I agree it is definitely too small to be the Goat's Head (and even though the resemblance was uncanny, the new shape I found is also incorrect in that it's a mirror image). The last time I saw the GH in one of (I think) A-Team's animations, however, it was directly over the pole & perhaps losing a horn. With all the thrashing being doled-out by the 2013-PAC, plus with the typical drift from the pole towards the Fram seemingly interrupted recently, the positioning seemed to be reasonable. Why does arctic ice spread out under the effect of a cyclone? The cyclonic winds close to the surface actually point slightly towards the center of the cyclone. Isn't the ice driven by the surface winds? Then why doesn't it follow the converging winds? More stupid questions: with less ice cover on the Arctic ocean, what will be the effects on the movement of seawater? What about the tides? Clearly we can expect to see seasonal flooding and erosion along Arctic shores normally protected by ice. But it's a huge body of water that will become more dynamic, at least in wave amplitude. It will be more affected by wind. What will be the effects of this? Won't there be massive changes in current? Can we expect a pan-Arctic gyre? One major implication of an "ice free" artic is the formation of the "North Atlantic Deep Water" (NADW). 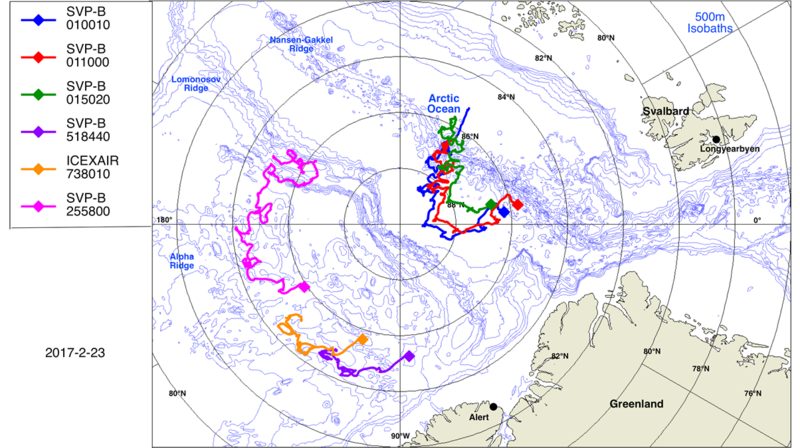 This is one of the main drivers for Thermohaline Circulation. It is possible that a disruption of the NADW could lead to extreme climate change, with less CO2 sinking to the ocean depths. Not very nice for the creatures of the earth. Its the same reason the wind goes round in a cyclone. The driving force for the wind is along the pressure gradient directly into the centre of the cyclone. The earth's spin carries it off at an angle (almost 90 degrees) instead. The ice is driven by friction from the wind around the cyclone, but the earths spin carries it off at an angle instead. If the ice was not restrained by its own strength, and by friction with the water underneath, it would go at almost 90 degrees to the wind and move directly outwards, just like the wind is at almost 90 degrees to the pressure. In practice these effects combine so that the ice moves at 20-30 degrees to the wind rather than 90 degrees to it. The water shows this spiralling of movement too. Just as the wind moves at an angle to the pressure gradient, and then the ice moves at an angle to the wind, the water directly under the ice moves at an angle to the ice, the next layer of water down moves at an angle to the water above it and so on. The simplest answer. Conservation of angular momentum. The air transfers its angular momentum to the ice. The net push is tangential to the center of the storm. Here is the wind field of GAC-12. I understand that the maximum density of fresh water occurs at 3.98C. Would seawater also reach it's maximum density at this temperature assuming salinity remained constant? it seems that increasing salinity lowers the temperature at which maximum density is achieved. I have what is probably a stupid question. Why was 15% chosen as the standard of measurement for sea ice area and extent? Is there a physical reason or is it merely an arbitrary choice that has been accepted for the sake of consistency? The satellite sensors and the algorithms have to distinguish land and open water from sea ice. Under some conditions (coastlines, weather) they reported sea ice where it was proven none exists. 15% was a good trade-off between accuracy (report real ice) and usefulness (navigation). I notice that when an isolated ice floe melts away, in the satellite photos there remain for a couple of days streamers of a white substance that appear to be in the water (at least don't move with the clouds). These make swirly patterns that can be many kilometers across. What is this stuff? Ice? Foam? Fog? Something else? What would it look like from sea level? Actually, they have fixed it. But the fix is not retroactive. OK, stupid questions 101: How will we know when or what the minimum sea ice area is? NSIDC's ruling is final. No correspondence will be entered into. Anne, in September we look at the weather forecasts. As soon as low pressure areas take over for a prolonged time, we can be pretty certain that area/extent on most graphs will start to gain. Only a high over the Beaufort, combined with a low over the Siberian seas can cause some final melt, compaction and transport that prolong the melting season, but no further than the end of September. Sure, I realise it won't go later than that! I'm just curious about the disagreements between the various systems of measurement, and how satellite data are compared with ground truth data. What actually happens at the end of the season when all this is wrapped up? Will Bremen agree with NSIDC? I'm new, so please bear with me. I had asked this in another thread, but since Anne had asked the importance of water temperature previously, and you have given an excellent explanation of ocean currents recently, I'll ask you. What is the relevance of air temperature when water has a factor of 2-3 times in heat carrying capacity? (not to mention the greater surface are below ice). Also, is the Arctic Ocean a true ocean, or is it a Mediterranean Sea because of the limitations of the Pacific inlet. What is the turn-over rate as compared to similar bodies of water? Thanks, and appreciate your patience. I'll try to answer that from some basic physics and reading around on wikipedia and the like. Water would have a much larger effect than air on the ice if it had the same temperature difference from the melting point and the same flowrate past the ice. Over large parts of the arctic ocean warm currents don't get near the ice because they are saltier, denser and therefore some 150m down. Where water is warmed by the sun nearer the surface it does have a strong melting effect. Your other question on the "short and medium term thread" seems to apply ideal gas law to a liquid? pv = nRT also can not determine temperature from pressure because volume is free to change. With heat transfered from an external source of energy pressure and temperature can theoretically take any value. The air is a significant factor only if it has a dew point that is different from 0C. If it is above 0C condensation is occurring, and one gram of condensation will melt 6.76 grams of ice. Air has a low heat capacity the amount of heat transfer from cooling the air down to zero is insignificant compared to the condensation dropping the dew point. If the dew point is significantly below zero, then any exposed water will chill rapidly due to evaporation. The normal convective air flow is from the cold to the warm, like on a beach in summer. So at the edge of the ice in the absence of a strong weather pattern, you do not get much melting from the air. But, of late there have been "dipole anomalies"(a high and low paired up an relatively stationary) and arctic cyclones that can overcome the local convection and torch the ice with warm moist air. The AO index is a measure of the vorticity of the arctic cell. A positive AO means there is a net cyclonic airflow a negative AO means a net anti-cyclone. A positive AO is considered to be favorable for melting and negative unfavorable. The long negative AO in July and early Aug. accompanied a slowdown in melting. Nicely put! Thanks for the numbers and insight, Vergent. Vergent, thanks very much for your explanation. If I understand well the GFS map you just posted, the warm air flow from Europe toward Central Arctic that some contributors are noting won't probably hurt ice much, don't you think? Air has a low heat capacity the amount of heat transfer from cooling the air down to zero is insignificant compared to the condensation dropping the dew point. If the dew point is significantly below zero, then any exposed water will chill rapidly due to evaporation. what surprises me in that statement is that at about 0 deg C partial pressure of water is very low, so one m3 of (saturated) air (=1.29kg) cooled from 3deg C to 0degC yields 1.6 g of liquid water condensation. Put in heat capacities and latent heat and you get 10.8g of ice melted from condensation and 11.6g of ice melted from temperature change in air. Evaporation similarly requires large quantities of air to evaporate significant amounts of water as water content changes not that much from lower to higher dewpoint. Condensation and evaporation clearly play an important role but not a dominant one it seems to me. They do indeed contribute pretty much the same. at total pressure of 1000mb that is 0.2 % Vol change in water content i.e. 1m3of air yields 2l of water vapour or 1.6g of liquid water. You give 6.67g of ice melt per g of condensation, density of air 1.29kg/m3 and heat capacity 1.005 kJ /kg K give 3.9kJ for temp change from 276K to 273K. 334J melt one g of water. Richard wrote pretty much the same as I was typing but I hope he doesn't mind me repeating. What would happen if the air was dry? Edit; Why do people in Palm Springs turn on the fan when the air is warmer than they are? In terms of melt I think these numbers mean that air at 3deg C with dew point of 3deg C dewpoint can melt about twice as much ice as air at 3deg C with dew point of 0deg C. That means humidity definitely matters just not overwhelmingly so. To work out what air at dewpoints below 0deg C does thing get more complicated. I guess air could become saturated with water vapour from sublimation which brings air temperature in the boundary layer down to 0deg C without melting ice, because air with a dew point of say -20deg C (partial pressure 1mb) would require the all the heat from its temperature change to sublimate water vapour to reach saturation. I think you have made your point, very dry air of temperatures not too much above 0 deg C would not melt ice at all. Thats me working from basic principles, if somebody has actual observations I am happy to be shown the error of my ways. Is there any validity to the assumption that under melting conditions, the rate of volume loss varies with the top and/or bottom surface area – I.e. when conditions are favorable, the larger the area, the faster volume is lost? If so could we not still be in for a surprise? day 261 - 7.002 ? Spread evenly over 6Mkm**2 (incorrect I know, but I’d guess optimistic w.r.t the prognosis for lower-latitude/FYI) that would correspond to an average reduction in ice thickness of 1.445M. Most of the ice isn’t that thick - Looking at HYCOM from today and subtracting 1.4M from the thickness I don’t see that this year is over yet – or even that another record loss is yet out of the question. Where am I going wrong? I asked about dry air. 3C air with 0C dew points is still quite moist. So, lets take -10 air from the summit of Greenland and slide it down the slope onto the ice. Through compression, it has warmed up to 3C, but it has a dew point of -10C. What happens when this dry air hits the meltponds and leads? Which way will the energy flow? From the air to the water? No! Evaporation must happen. A little energy for this evaporation will come from the air, a lot will come from the water. When air and water interact almost always either net condensation or net evaporation is happening. You chose the single point where that was not true. They turn on the fan because the wet bulb temperature is cooler than they are. There is a competition between increased transport of heat from the air to the skin, against increased transport of evaporated sweat away. The wet bulb temperature is the temperature at which these transport rates balance. Moist surfaces above the wet bulb temperature will be cooled, and those below it will be heated. Increasing the convection increases the effect. If the wet bulb temperature is higher than you are, you aren't going to live long, and turning on the fan will just kill you quicker. The drier the air, the lower the wet bulb temperature. If air at 3C has a wet bulb temperature of -2C when the artic surface temperature is -1C there is net cooling, and if the wet bulb temperature is 0C there is net heating of the surface. Everything you said was correct, keep up the good work! The temperature does not dictate the heat flow, the dew point does.